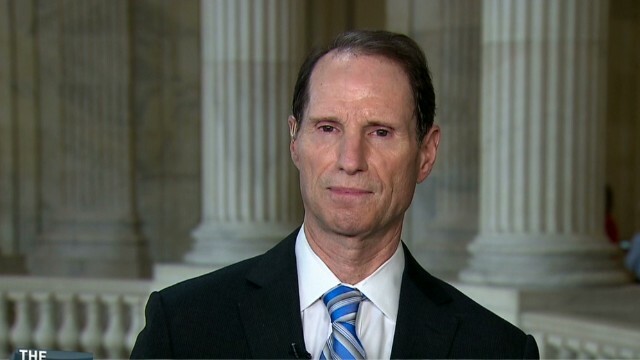 Today on The Lead with Jake Tapper, Sen. Ron Wyden joined the program for a rare interview to discuss a newly declassified document that provided evidence of how the intelligence community has misled Congress about the National Security Agency’s massive surveillance programs. Highlighted news excerpts from the interview are below; a full transcript is after the jump. “In the document that was declassified today, it talked about how the bulk collection of e-mail was a vital capability. That was the specific language used by the intelligence community. And Senator Udall and I believed early on that that was not the case. We kept pressing the point. We were able to show that it was in effect worthless. JAKE TAPPER, CNN: I’m joined now by the senator from Oregon, Ron Wyden. SEN. RON WYDEN, D-OREGON: Thank you for having me, Jake. TAPPER: I know there’s only so much you can say about “The Guardian” story today about the Keyscore program, but broadly speaking, the concern is that American data is being swept up in these vast reservoirs of information, and who knows what happens to it. Do you think as a member of the Senate Intelligence Committee, who is privy to this information, do you think there are enough rules to prevent anyone low-level intel analysts or anyone without a warrant from accessing this information? WYDEN: Jake, here’s what I can tell you specifically, because I can’t get into the “Guardian”‘s story. What I can tell you is last December during the debate about the Foreign Intelligence Surveillance Act, I specifically spoke on the floor of the United States Senate about what is really called the backdoor search loophole in the Foreign Intelligence Surveillance Act. And that’s a loophole that allows for the examination of phone calls and e-mails on Americans without a warrant. That’s somebody that I believe needs to be closed and apropos of your conversation, I think this is a unique time in our constitutional history. I don’t think we should let this time go by without striking a better balance between security and liberty. TAPPER: You seem to be suggesting though that there are not constraints, not enough safeguards on who has access to this information that we all now know about? WYDEN: I particularly believe that the bulk collection of hundreds of millions of phone call records on law-abiding Americans is a very substantial invasion of privacy. When you know who somebody called and when they called and where they called from, you have basically been establishing a human relations database. For example, if you know that someone called a psychiatrist twice in the last 36 hours, once after midnight, you know a lot about that person. And it could have great implications for them, say, with their employer. TAPPER: The director of national intelligence, Mr. Clapper, released some information today. And there seemed to be two significant items in what he released. One is about this bulk e-mail collection program that operated until 2011. Intelligence officials had said they shut it down on their own, though it was you and Senator Udall who pushed for it to be shut down. You have said in the past that intelligence officials gave statements about the value of this bulk e-mail collection program, statements that were not true. With today’s declassification by Clapper, can you say with any more specificity what wasn’t true in the assertions that these officials were making about bulk e-mail data collection? WYDEN: I can’t get into the details, but let me be very specific about what concerned Senator Udall and I. In the document that was declassified today, it talked about how the bulk collection of e-mail was a vital capability. That was the specific language used by the intelligence community. And Senator Udall and I believed early on that that was not the case. We kept pressing the point. We were able to show that it was in effect worthless. That’s the reason that it was eliminated. And yet the intelligence community, when they first described it a few days ago, they said it was for operational reasons. The fact of the matter is, Jake, on issue after issue, too many of the leaders in the intelligence community have not just kept the Congress in the dark. The Congress have been given inaccurate statements and in effect been actively misled. TAPPER: Another line of defense from Clapper is that they scoop up tons of information, but it’s OK because they have rules about how to access it. Now, you have said there are a couple issues with that, first that the scooping itself violates privacy. But, second, there are questions about whether there have ever been any violations. Friday, intelligence officials acknowledged in a letter that there have been some violations. With today’s declassified information, can you shed any new light on what these violations on Americans’ privacy were? WYDEN: I can’t get into those details, but again I will try to add a little bit of context. First, those violations that the intelligence community, General Clapper specifically referred to, were violations of court orders, Jake, violations of court orders with respect to the bulk collection of the phone records. So when you hear somebody from the community say there aren’t any violations, we will point to that one very specifically. Second, what was stated in the letter to Senator Udall, myself and 24 other United States senators in my view didn’t fully portray the extent of the problem. The problem is in my view significantly more troubling than was represented by the intelligence community. TAPPER: All right. Senator Ron Wyden, we have been talking about this issue for weeks. We have wanted you as a guest, and we are going to continue to come back and try to get you on the show to talk more about this very important issue. WYDEN: We will do it again. TAPPER: Thank you, Senator. Appreciate it.